From the outset, Jewel Master: Cradle of Rome makes no attempt at claiming to revolutionize the match-three genre. The box art itself lets shoppers know that the title is "Perfect for fans of Bejeweled and Jewel Quest," but after playing even one level of the game, it becomes clear that Cradle of Rome offers so much more than you might expect. Cradle of Rome actually takes the Bejeweled template and kicks it up a few notches. No longer are you simply playing to achieve a higher score than your friends; instead, Cradle of Rome places you in the role of city builder, with the task being to build a sprawling version of Rome by collecting building materials, monetary funds, and food in each of the game's levels. Instead of simply matching multi-colored gems, Cradle of Rome's pieces come in the form of stacks of lumber, rings, fish, chicken legs, boulders, pearls, and so on, with each "match three or more" combination adding to your running totals of supplies, gold, and food. The controls are intuitive and require little more from you than simply moving your pointer around the screen with the Wii Remote and combining a press of the A button with a slight flick of the wrist to switch any two gems either horizontally or vertically to create a match. After each level, you can check your building status by hovering over the list of buildable objects at the bottom of the screen. At the beginning of the game, resources are scarce, so you must first construct a mill, a blacksmith's shop, a well, and other structures pertaining to the fundamental needs of a village. Each building requires a certain amount of money and supplies to build, along with a required portion of food, which will be used to feed the workers who build it. Once your plot of land can support a larger population, you are allowed to build a city proper, and afterwards, continue to add all of the accoutrements to create a grand Roman Empire. Items like temples to the Gods, ports, warships, grand archways and even the Coliseum must be built before your city is truly complete, with each object requiring a larger amount of funds than the last. That is, where the first few objects can be built after completing only one or two levels, by the end of the game, when you are building grand temples to Gods like Neptune, each of your piles must contain at least 40,000 units, and with each level adding only around two or three thousand units to each, building anything becomes a very time consuming process. That being said, the game isn't difficult. Each level tasks you with turning blue tiles to gold ones by creating a match on top of them, and each level comes equipped with a substantial time limit sometimes reaching twenty minutes or more. 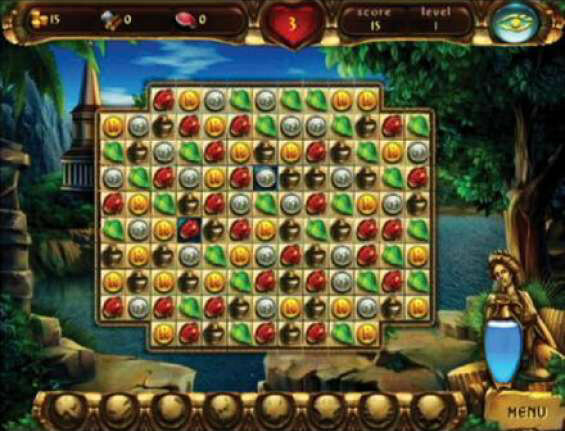 Later levels add another layer to the titles, forcing you to create two matches on them before they turn gold, while other tiles are locked up in chains, forcing you to make either one or two matches with said locked pieces before they can be moved (and therefore, before their tile can be turned to gold). Each level contains a bonus gem type in addition to those that add to your money, supply, and food piles. 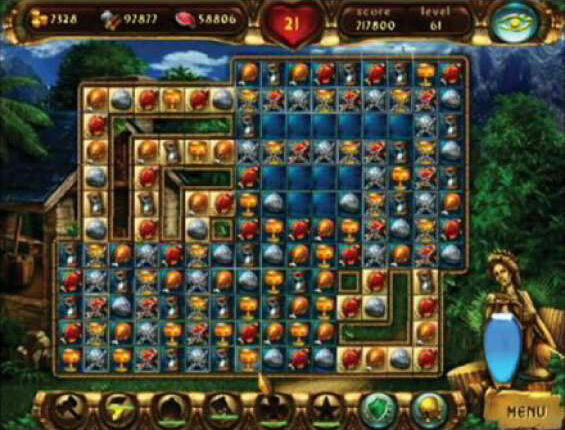 These bonus gems fill meters at the bottom of the screen that activate power ups like the hammer, which can destroy any one gem on the screen, thus turning its tile to gold, and bombs which function in the same way, only nine squares at a time. Lightning bolts destroy twenty random tiles, the hourglass gives you extra time to complete the level, the star destroys all tiles containing the same object, the plus sign destroys one tile while adding 1,000 units to whichever stockpile you choose, the shield destroys a horizontal row of tiles and so on. In this way, the game's sheer amount of power-ups brings a real element of strategy to what is normally a simple, casual gameplay formula. That is, in levels where you are earning lighting bolt pieces, every other power up may only be used once, and that's only if you have saved it over from previous levels. Even though using said "out-of-level" power ups will force you to wait until that power-up's level type cycles back around (sometimes taking five or more levels), they can help you get out of a frustrating spot, when you only need to change one more tile to gold and are tired of waiting for luck to work in your favor. All in all Cradle of Rome isn't lacking in length. Once you pass the 50th level, subsequent rounds can easily take ten minutes or more each, but for those who are incredibly familiar with the match-three mechanic, there is never any real difficulty. As I made my way through the game, I never once lost a level, and had racked up over 20 lives before everything was said and done (lives are awarded for every 20,000 points earned). What is lacking however is made apparent when looking at the game from a technical standpoint. While each individual gem type is a crisp, bright and colorful object, they are all downright tiny. This, in addition to the fact that the game's playing fields are so large, immediately forced me to take up position two feet in front of my television, once again struggling to force my Wii sensor bar to pick up on my pointer's movement, as seems to be the case with every other Wii game of this type. Furthermore, even though the soundtrack is a perfect mix for the ethnic theme within which the game is presented, and is comprised of calming and catchy tracks that will no doubt have you humming along, there are only a handful of songs in the entire game, making each repeat far too many times when considering how long the game lasts. 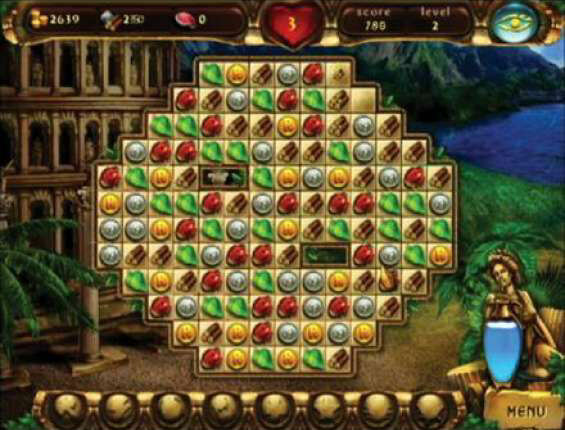 However, at a budget price of twenty dollars, the game's technical flaws can be looked past, making Jewel Master: Cradle of Rome a more than worthwhile experience, especially for fans of the genre, and made even more addictive by the fact that instead of simply working to beat your previous score, you have a real, tangible goal set out before you. Even though the game tries so diligently to compare itself to games like Bejeweled and Jewel Quest, I'd say it's more than a step ahead of the competition.